People who play sports, hit the gym regularly, or participate in athletic training are prone to common sports injuries. These injuries can be caused by an accident or simply by years of repeated strain to a part of the body. A sports medicine doctor specializes in treating the musculoskeletal system, which is regularly impacted by common sports injuries. Despite their title, sports medicine doctors also treat similar injuries that occur off the playing field or court. Here’s what you need to know about the common sports injuries a sports medicine doctor treats so you can determine if you need the help of one of these specialists. The musculoskeletal system is the support system for the body. Muscles, joints, tendons, and nerves that are repeatedly under stress day in and day out can eventually be injured. Typically, repetitive stress injuries are seen in the shoulders, knees, ankles, and back. They happen because of overuse or when improper techniques are used during physical activity. Heel pain is a common repetitive stress injury among athletes and non-athletes alike. The heel undergoes a lot of stress every day since it supports the entire weight of the body. When you walk or run that force becomes even greater. For many people, the pain goes away after a period of rest, but for some it can also linger. Repetitive stress injuries are treated by sports doctors on a regular basis. In most cases, anti-inflammatory medications help provide relief. Physical therapy can also help improve strength and help you regain proper range of motion. In rare cases, surgery is needed to correct the underlying issue. Every year millions of people break bones. The latest emergency room statistics from the Center for Disease Control show that, of the 136.3 million ER visits in 2017, 2.7 million were due to fractures. It’s an injury that affects people of all ages, particularly those over 65. The treatment a sports doctor uses will depend on the extent of the break. A hairline fracture may only require a splint or orthopedic boot. When a fracture is severe it will require a cast for 3-8 weeks. The worst fractures require surgery in order to put the bone back together and fuse it in place with metal pins and screws. Knee injuries are very common sports injuries because the joint bears the stress caused by sudden stops, sprinting, pivoting and side to side motion. A number of ligaments and tendons on the outside and inside of the knee bones keep everything in place by providing support. All it takes is one sharp movement in the wrong direction to tear an anterior cruciate ligament (ACL), medial collateral ligament or meniscus cartilage. If you hear the tell-tale “pop” sound, feel a sudden sharp pain or sense looseness in the knee area there’s a good chance you tore something. A sports medicine doctor can perform a physical exam and MRI to assess the damage. In some cases, a minimally-invasive arthroscopy procedure is needed to fully gauge the damage and best course of treatment. Minor tears typically require time to heal and physical therapy. However, a major tear can require reconstructive surgery that involves removing the affected ligament and inserting a graft. There are over 650 muscles in the body. They connect to our bones to enable our body to move. As expected, a muscle injury can significantly impact a person’s ability to get around, and their physical activity could be severely limited. 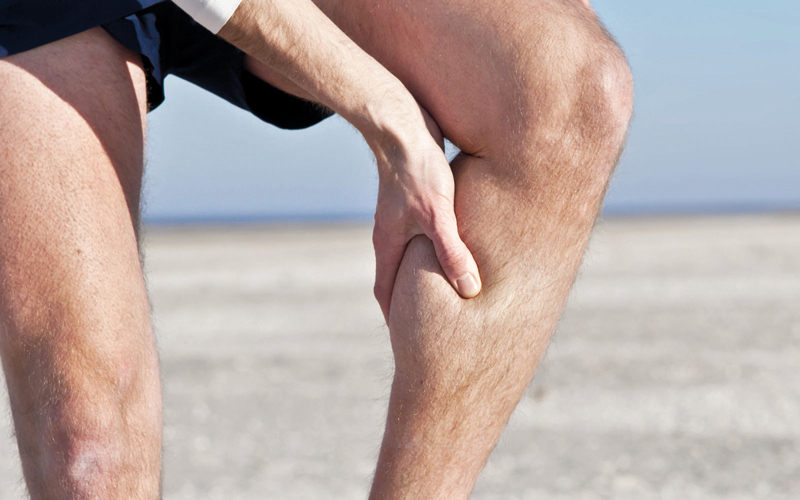 Strains – This is when the muscle is overexerted or rapidly contracted and the muscle tears. Contusions – Impact to the body above the muscle can cause irritation or a tear in the muscle. Elongation – If the muscle is stretched too far the fibers can be torn. When a joint is knocked out of its normal position that is called dislocation. It can happen to anyone at any time if they fall or run into something. Dislocations are most common in the shoulders, fingers, hips, toes, elbows, ankles and knees. When someone comes to a doctor with a dislocation, the treatment all depends on which body part is affected and how badly it has been dislocated. Age can also be a factor that the doctor considers. The joint needs to be put back in place using either manual repositioning of the bones or through surgery. In either case the patient usually has to wear a splint or sling for a period of time and go through rehabilitation to regain full mobility. Always see a doctor if you suspect you have any of these common sports injuries. He or she can help you figure out if anything needs to be prepared as well as the best way to repair it so you can get back in the game as soon as possible.